DECHEN LING, in Ashland, Oregon, provides opportunities to study and contemplate the teachings of the Buddha, as transmitted by the Nyingmapa Lineage. We are the official, in-town center for Tashi Choling Center for Buddhist Studies, directed by Ven. Gyatrul Rinpoche. Tashi Choling is located 30 minutes from downtown Ashland, in the Colestine Valley (Tashi Choling’s website). Dechen Ling offers classes and practice groups to a wide range of students, from beginners to advanced practitioners. Dechen Ling was incorporated in 1994 as a non-profit tax exempt corporation by Lama Yeshe Nyima, and has been at its present location since 2005. Dechen Ling is currently open during scheduled class times only. 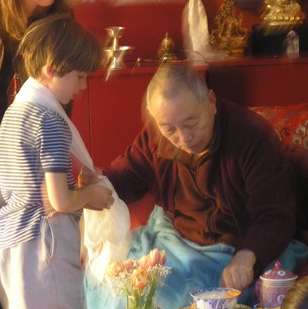 WHAT WE OFFER: Study and practice groups led by teachers and senior students authorized to teach by the Venerable Gyatrul Rinpoche. See our Events page for current information. THANK YOU DONORS AND VOLUNTEERS!!! YOUR SUPPORT MAKES DECHEN LING POSSIBLE! May all motherly sentient beings filling all of space achieve happiness and the causes of happiness. May all be free from suffering and the causes of suffering. May all be free from attachment and aversion and live believing in the equality of all that lives. Please see our Events page on this website. Also, if you would like to receive the monthly calendar and email updates from Tashi Choling, which includes news from Dechen Ling, please send an email to tcnewsletter@gmail.com In the subject field write the word: subscribe. In the body, include your name and email address. Dechen Ling is not financially dependent on any other organization, and relies on donations to cover operational expenses. Dechen Ling also relies on volunteer support. If you wish to make a donation, click on the “Donate” button below to make a donation through PayPal, or make checks payable to “Dechen Ling”. Visit our Donate page for additional info. Thank you! Volunteers, please visit our Contact page and let us know when you are available!